This past week, the mother-in-law landed. Since her arrival, there has been a tremendous amount of food on the counter, in the fridge and at the table. Borscht, chocolate cake, grilled fish, pita, quiche, falafel, zucchini casserole, mamaliga (aka polenta), banana bread, fritters, and an absurd amount of produce, which all lead to the never ending story of fridge rearranging. I could barely close the refrigerator door all week. It just kept multiplying. Before we go any further, let me be quite clear. This is definitely not a bad thing. However, the wayward fruit hidden at the back of the fridge didn’t get much love. Yes, they were plucked from a market vendor at their prime and should have been enjoyed right away, but have since been neglected and almost forgotten due to lack of visibility. 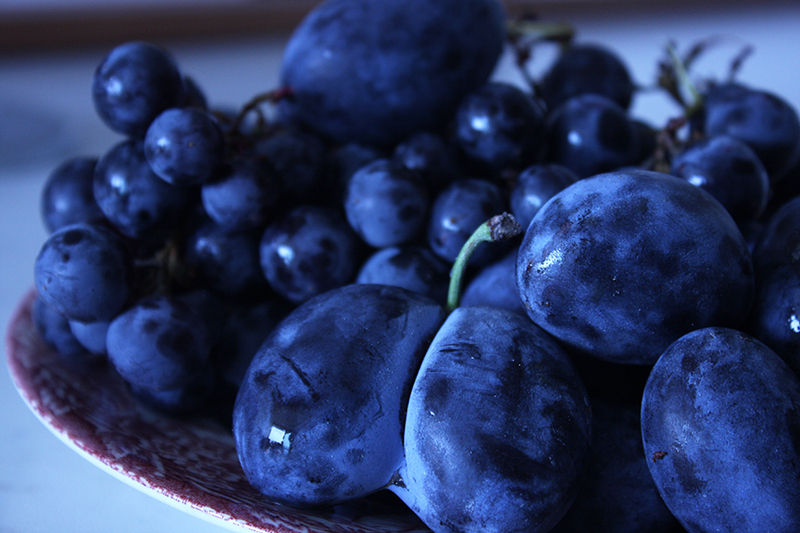 Point is, I was confronted by a batch of plums and grapes that were, quite frankly, pissed. They only had a few days left, and they didn’t want to spend them decomposing in refrigerator purgatory next to a jar of pickles. Jam certainly wouldn’t be good enough to prevent the flogging I knew was coming. I definitely didn’t want them to come back and haunt me in the middle of the night like the ghost of produce past. It was time for an old standby. Everybody knows the way to make true amends is with butter. Butter got me into college, helped me avoid several speeding tickets and could possibly bring peace to the Middle East. Well, not really, but it certainly can put a smile on your face. If I were a plum, I’d prefer to go down encased in buttery pastry and crumble versus dying a slow death in the back of an over-filled fridge. And thus it happened. 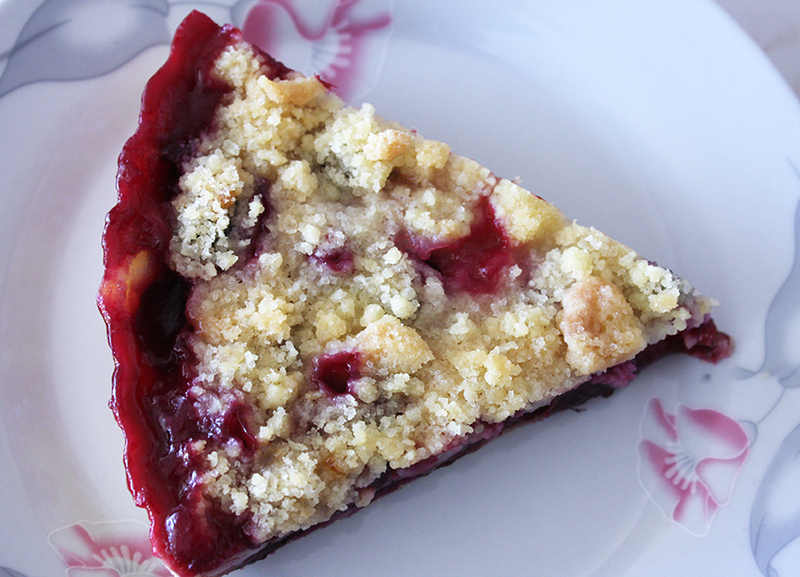 The plums and grapes were tossed with lemon zest and sugar, then loaded into a buttery pastry crust topped with big chunks of buttery crumble, and finally baked until bubbly and gooey. Combine the flour, salt and sugar in a large bowl. Add the cold butter. Using your fingers, rub the butter into the flour to break it up until there are no more large pieces of butter and mixture resembles small peas. A mixer will work too, but, as I always say, the crust will be flakier if you use your fingers. Takes but a moment. Grease a 8″ tart pan. On a lightly floured surface, roll out the dough to 1/4″ thick in the approximate shape of your tart pan. Gently shape the dough into the tart shell without stretching it. Trim off most of the excess dough, but not all. Return to fridge and chill for 15m. 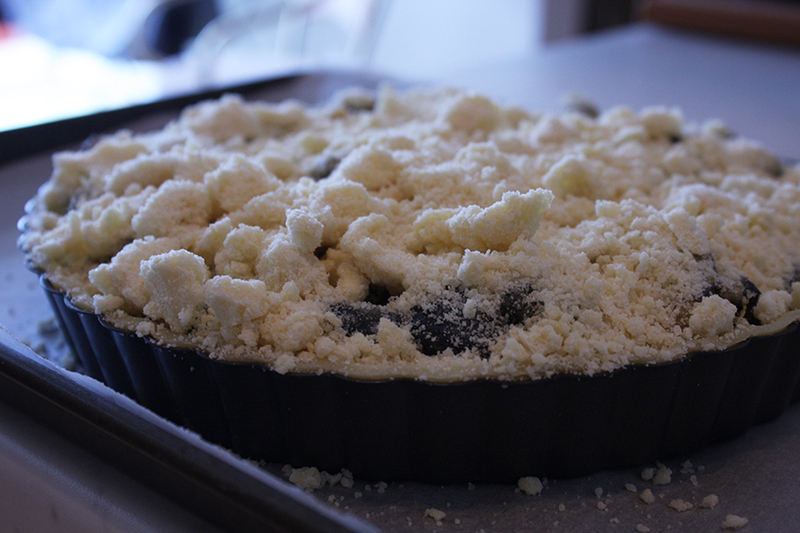 While your dough is chilling (before you roll it out), make the crumble topping. Combine the flour, sugar and butter in a large bowl. Again, using your fingers, rub the butter into the sugar and flour until the mixture resembles a mixture of large and small crumbs, but no large pieces of butter remain. 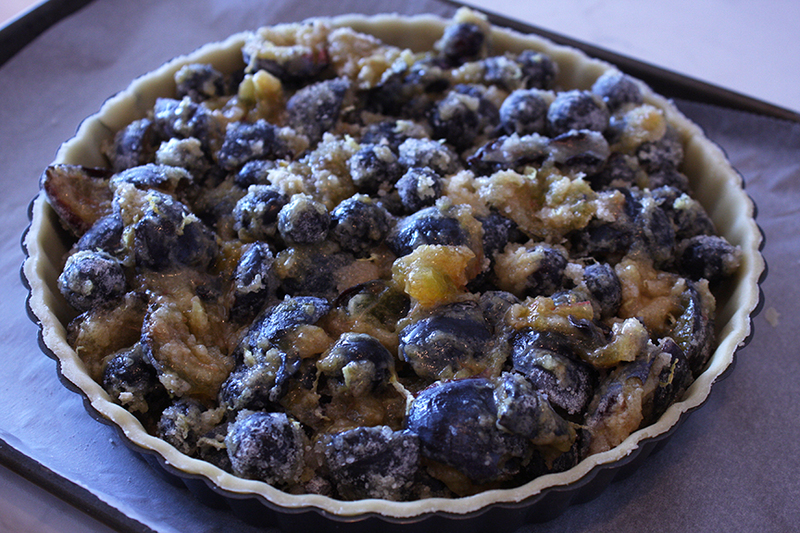 Keep in the freezer (preferably) or the fridge until you are ready to assemble tart. While your tart shell is chilling for the last 5 minutes, prepare the filling. In a large bowl, mix together the sugar, flour and zest. Add the fruit and toss until fruit is thoroughly coated. I don’t mix the fruit with the sugar and flour in advance. Doing this draws out the juices creating a soggy tart shell. GROSS. It only takes 30 seconds to throw together, so wait until the last minute. Remove tart shell from fridge and place on a parchment or foil-lined cookie sheet (the tart will likely bubble over so this prevents molten fruit filling from charring on the bottom of your oven). 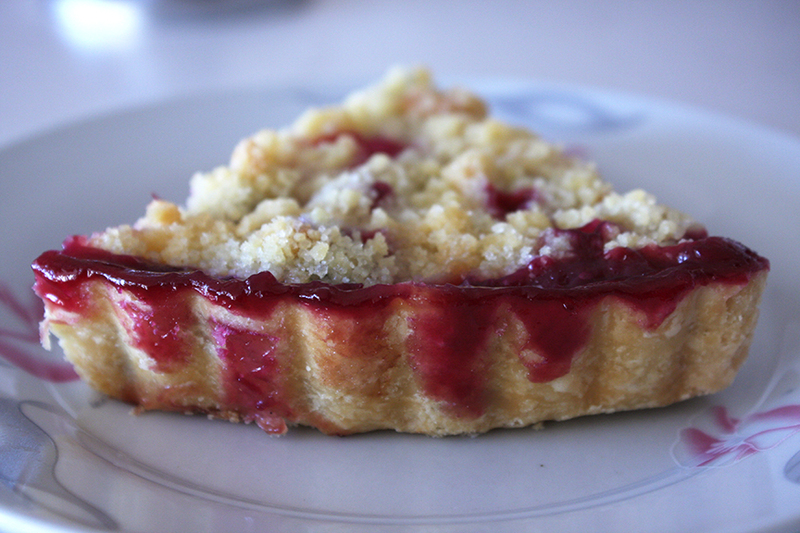 Pour in the filling and spread it evenly around the tart shell. Top with the crumble. 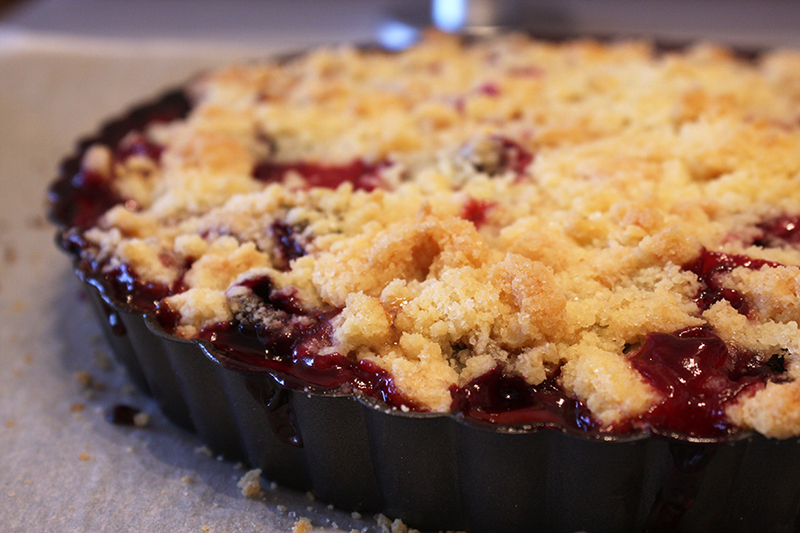 Bake tart for 1 hour, until bubbly and crumble is golden. This looks so tasty, what a great way to use up all the plums! Tried this recipe and it turned out lovely! Thanks! Hi Fran – That’s wonderful! Glad you liked it.